Oval diamonds are gorgeous! They have a slightly elongated shape, which also makes them appear larger for their carat weight. Who doesn’t want that?!? Remember, I wrote a blog a few months ago about the average mm size for a 1 carat diamond. If you didn’t read it, you can check it out here. In my opinion, oval diamonds should fall into certain parameters to get the best brilliance and sparkle for your money. Search for oval diamonds with a table between 55-60% (you can expand this slightly if you want), depth percentage between 59-63% (again, you can expand this slightly if you want) and a length to width about 1.33 – 1.66. Length to width ratio is critical to the overall shape, but really it is a matter of personal preference. Personally, I love about a 1.40 l:w ratio for oval diamonds. This oval diamond engagement ring originally began as a custom design. 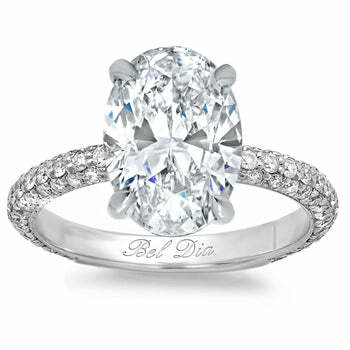 It features a thin 1.7mm U pave hand set diamond shank with a little surprise under the basket… more diamonds! With this ring, you can choose the traditional ‘north south’ setting or go more modern with setting your center oval diamond ‘east west’. Stunning! 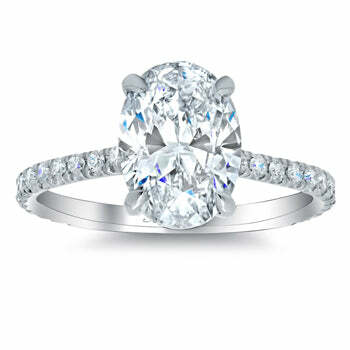 This 3mm wide pave diamond shank couples perfectly with an oval center diamond. This setting can be set with other diamond shapes, but there is just something about an oval diamond in this ring! Just fabulous! When you are on the hunt for that perfect oval diamond engagement ring, think deBebians! We have a vast selection of engagement ring settings and if you don’t see what you like, we can always custom manufacture it for you. Check out our custom engagement rings page here. Happy shopping!